In Blogger.com / Blogspot, how to add a widget above the Blog Post section? Widget above post will make us easy to post welcome greetings, lasted updates, emergency notices, etc, it's a nice feature if we can get. Yes, there's a way to make it happen. 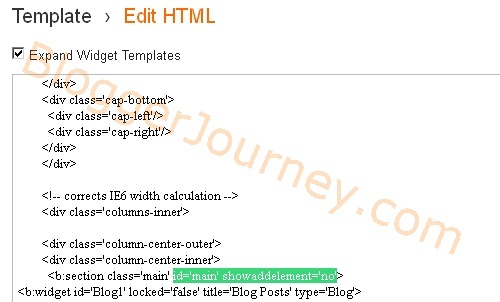 By default , after a new blog created in Blogger.com, you can add more widgets at your right- or left- side widget section, but you do not have the option to add widget above the Blog Post section. The fact is, there is a widget there, but Google hide it ! So let's make it turned on. Take a look above the Blog Posts, there's no widget or option for you to add anything. So after the widget enabled, you will get a "add a Gadget" bar above the Blog Posts section. The solution is very simple- we can simply do it by change the code from 'no' to 'yes' from the the blog template. 2. On your keyboard press the "Ctrl" and "F" keys at same time to bring up the search box. Notice the green color highlighted codes in above screen, it says showaddelement='no' ? Ok, now change the 'no' to 'yes', that's the only thing we need to do ! 5. Click on 'Save temple' at the bottom, then click on 'close' to close the template window. You can now go back to dashboard and click on Layout again, do you see the "add a gadget" shows up above the Blog Posts section? What's your experience of using widget? How do you add widget if it's not available by default? Share your experience and insights in the comments box below. Thanks so much for this, worked like a charm!